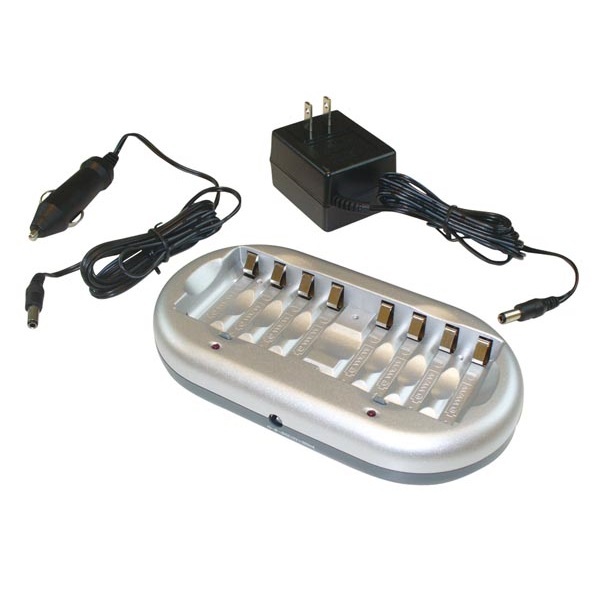 This NiMH/NiCd Battery Charger accepts up to 8 AA or AAA rechargeable batteries. While most robots don't eat very much food they sure do eat a lot of batteries. We always recommend using rechargeable batteries for your robot projects. NiMH rechargeable batteries are preferred. This charger will accept up to 8 AA or AAA rechargeable batteries at one time. Charging time varies from 4 to 7 hours depending on the size and type of batteries. It can charge 2, 4, 6 or 8 batteries at a time and supports both NiMH and NiCd battery types. A safety timer prevents the batteries from overcharging and red LEDs display the charging status. Comes with an AC adaptor and 12V car adaptor.